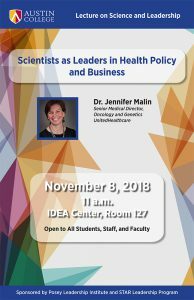 Dr. Jennifer Malin will present the annual Austin College Lecture on Science and Leadership Thursday, November 8, at 11 a.m. in IDEA Center, Room 127, on “Scientists as Leaders in Health Policy and Business.” The lecture is free and open to all students, faculty, and staff. 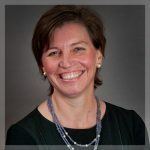 Dr. Malin is a senior medical director of oncology and genetics for UnitedHealthcare and will talk about the ways in which she utilizes clinical leadership and strategic planning in her work. A Harvard University graduate, she received her medical degree and doctorate in public health from UCLA. She is board-certified in internal medicine and medical oncology. A clinical professor of medicine at the UCLA David Geffen School of Medicine, Dr. Malin is the author of more than 100 peer-reviewed articles and is widely recognized for her research on the quality of cancer care. She has served on a number of advisory boards and national committees, including the American Society of Clinical Oncology’s Quality of Care Committee and the National Quality Forum’s Cancer Steering Committee. Prior to joining UnitedHealthcare, she was the architect of the cancer care quality program at Anthem. Dr. Malin continues her clinical practice by volunteering at the Veterans Affairs Greater Los Angeles Health Care System. The lecture is sponsored by the Posey Leadership Institute and the STAR Leadership Program. The Posey Leadership Institute focuses on developing the next generation of leaders in their respective areas of study by providing opportunities to learn and do leadership in the classroom and beyond. The STEM Teaching and Research (STAR) Leadership Program strives to engage all science students in the study and practice of leadership in their personal and professional lives, and promote personal, team, and organizational effectiveness in the laboratory and classroom. The STAR Leadership Program provides the foundation not only for successful professional careers but also for increased civic and community engagement. Austin College, a private national liberal arts college located north of Dallas in Sherman, Texas, has earned a reputation for excellence in academic preparation, international study, pre-professional foundations, leadership development, committed faculty, and hands-on, adventurous learning opportunities. One of 40 schools profiled in Loren Pope’s influential book Colleges That Change Lives, Austin College boasts a welcoming community that embraces diversity and individuality, with more than 40 percent of students representing ethnic minorities. A residential student body of approximately 1,285 students and a faculty of more than 100 allow a 13:1 student-faculty ratio and personalized attention. The College is related by covenant to the Presbyterian Church (USA) and cultivates an inclusive atmosphere that supports students’ faith journeys regardless of religious tradition. Founded in 1849, the College is the oldest institution of higher education in Texas operating under original name and charter.